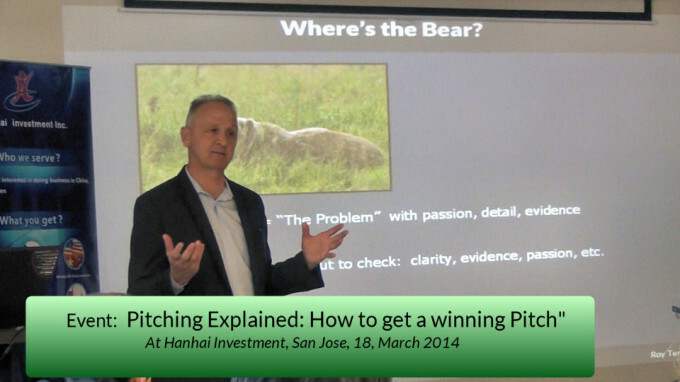 Thanks to everyone who attended the Pitching Explained: How to get a better Pitch Event ! I will add more links to people and content mentioned as time permits. If you gave me a business card I will email you when all the material has been added. Or you can just comment on this post with an address and I will add you to the notification list. There are three things every new founder or entrepreneur needs to know about pitching. Ever been to a pitch practice or even a Toastmasters club? Even the smartest person in the room seems to shrink as they speak to the group. And, unless you’ve secretly practiced from age 10, your experience will be the same. Don’t let the cold water discourage you because you will get better! Pitching doesn’t need to be that hard because at base it’s an extremely simple challenge: Share common concerns, invoke a solution and envision the new future. Feel free to read that sentence again. It is the bare bones minimal structure of every pitch. Progress is quick if you STOP practicing he wrong way and start following step #2. The Primal Pitch is dedicated to following these points and helping anyone and everyone who seeks pitch improvement to progress as fast as possible. And there’s more. 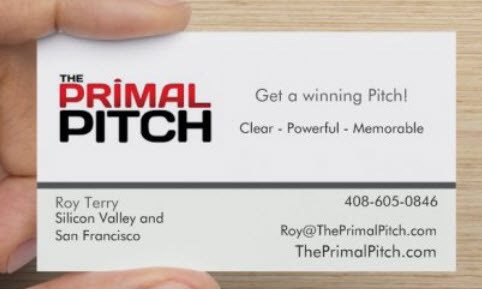 Primal means the pitch is more than information. Primal means the pitch is also a performance, preferably planned! Please signup to receive notice of events, videos and monthly highlights as we take on the great pitching challenge right here in Silicon Valley.